The Absolute Best Home Remedy For Heartburn Relief | Give It A Try! If you’ve experienced the burning sensation from heartburn, you know how uncomfortable it is. It’s like your entire chest and throat are on fire. You’ll do anything to quench the flame. Unfortunately, over-the-counter products don’t address what’s causing the problem. There’s great news, though, because the absolute best home remedy for heartburn relief does just that! This unpleasant condition is triggered when acid, specifically lactic acid from the GI tract, travels up the esophagus, throat, and even to the jaw. I used to think heartburn was due to stomach acid, or HCL, entering the esophagus. This isn’t the case, if it were it, the HCL would burn your esophagus. Lactic acid is a weaker acid, and although uncomfortable, is not as damaging as HCL. This weak acid is stimulated when the pH of the stomach is too high, making it alkaline. The only time I’ve had heartburn was for a week or so towards the end of my last pregnancy. It was pretty miserable and would hit at night when I was laying down. I didn’t know what to do, at the time, so I suffered through it. Many people suffer from this very common condition. If you only have heartburn once in a while, it’s not a cause for concern. But if you have it, on a frequent basis, you’ll want to get to the root cause to prevent future occurences. What do most people do at the first sign of heartburn? I’ll bet you can guess? Yep, they make a mad dash for calcium-containing products like Rolaids or Tums. This is unfortunate because this is exactly what you should NOT do! It does make sense, though, since calcium is an alkalizing mineral, and most people believe heartburn to be an acidic condition. In reality, however, heartburn is a condition of too little acid, which is counter intuitive. It would then follow that the best course of action would be to acidify your stomach. The stomach, ideally, should have a pH of around 1.5 to 3.5 .That’s highly acidic, and rightly so, because strong acid is needed to break down protein into individual amino acids. Heartburn occurs when the stomach becomes too alkaline, perhaps at a pH of 6, causing the release of lactic acid as a compensatory mechanism. This acid is what causes the symptoms of heartburn. Popping a Tums will neutralize esophageal acid, reducing the burning and pain, and causing short-term relief. That is, until the next episode. Calcium effectively treats the symptom, but perpetuates the problem of low acidity due to its alkalizing effect. This, in turn, creates even more negative symptoms because the underlying condition, of too little acid, was not addressed. 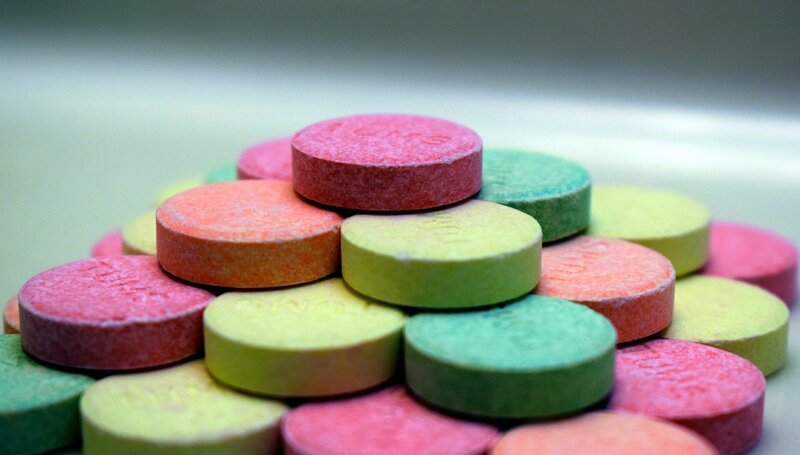 Overtime, continued use of antacids, leads to GERD or gastroesophageal reflux disorder. GERD occurs when the esophageal sphincter at the bottom of the esophagus doesn’t remain closed as it should. This is caused by too high of a pH, allowing acid to enter the esophagus. This is a big deal because GERD can foreshadow more serious conditions like irritable bowel syndrome and irritable bowel disease, including Crohn’s and Colitis. Now that you know what causes heartburn, let’s take it a step further, and explore why stomach acid would be low in the first place. Also, called hypochlorhydria, low stomach acid is not just responsible for heartburn. It is an underlying problem involved in numerous health conditions, including, leaky gut, inflammation, poor nutrient absorption and autoimmunity. HCL, or stomach acid, is not only critical for proper digestion and absorption, but for the sterilization of food before it travels to the small intestine. This prevents potential infections caused by bacteria and pathogens, meant to be eradicated in the stomach. Stress: This includes stress of all kinds, whether it be physical, emotional, environmental, and even structural. Stress limits the production of HCL in the stomach due to the sympathetic nervous system being overstimulated. This system is the fight or flight branch of the autonomic nervous system. If you’re being chased by a tiger, digestion is not a priority. This is the message stress sends to the body. Imagine the effects of chronic stress on digestion! Infections: H. Pylori is a common infectious bacterium that lowers stomach acid, leading to a plethora of conditions and symptoms. Food sensitivities: Sensitivities to certain foods trigger a stress response in the body, lowering HCL production, leading to a vicious cycle of more food sensitivities, and further reductions in stomach acid. Overuse of medications: Common medications like Tylenol, aspirin, and ibuprofen degrade the lining of the stomach, inhibiting HCL production. Proton pump inhibitors used to treat acid reflux and GERD also reduce stomach acid. Poor food choices: High-carbohydrate diets lead to blood sugar dysregulation, raising stress hormones that lower acid production. You’ll digest your food better if you’re in a relaxed state when you eat. Eat slowly and chew your food well to optimize digestion. Are you ready for the best remedy out there? You won’t believe how simple and effective it is. At the first sign of heartburn, drink a glass of water with one tablespoon of apple cider vinegar in it. This will acidify your stomach, relieving your symptoms, and preventing heartburn in the future. Please don’t buy into the lie that alkaline water is good for heartburn. It may provide relief, but exacerbates the problem. If a tablespoon of vinegar is hard for you to get down, start with a teaspoon. This remedy works because it solves the problem that caused the symptoms. Taking an acid like apple cider vinegar (ACV) balances your body’s own production of acid. Not only will you get relief, you’ll begin to eliminate the problem. I know many people that regularly take a teaspoon of ACV in a few ounces of water before each meal. It’s a great digestive aid, whether you have heartburn or not. Additionally, ACV has many other benefits. This is a good brand . It contains electrolytes like potassium and sodium, balances blood sugar levels, increases mineral absorption, while stimulating the liver to release bile from the gallbladder, and the pancreas to secrete its enzymes. Bile is essential for optimal fat digestion, and pancreatic enzymes break down protein, fat, and carbohydrate, while also releasing sodium bicarbonate, neutralizing stomach acid before it enters the small intestine. Can you see how important stomach acid is? It initiates a chain reaction in all the organs of digestion. If you’d rather take a capsule, consider HCL tablets or malic acid. You can buy malic acid in powder form. I rotate between ACV and malic acid before my meals. Malic acid is easy to add to a little water, and doesn’t taste bad. Both will aid digestion and absorption by optimizing stomach acid. Realize, too, that with age, stomach acid decreases. I think it’s a wise practice to take a digestive aid with each meal to ensure you’re adequately digesting your food. I know it’s tempting, when you’re in pain, to opt for quick-relief solutions like over-the-counter antacids. A better strategy, is to eliminate the underlying cause once and for all, enabling relief long term. Apple cider vinegar takes a little getting used to, but if you’re like me, your body will start to crave it. I think this is due to its ability to increase mineral absorption. Do you have heartburn? What remedies work for you? Please share you ideas and suggestions below. It helps everyone reading this post.